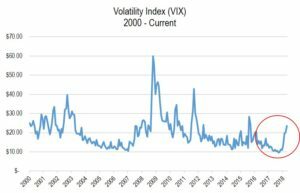 The first quarter witnessed the return of somewhat higher than normal volatility as compared to recent years (and certainly compared to the abnormally low volatility of 2017). 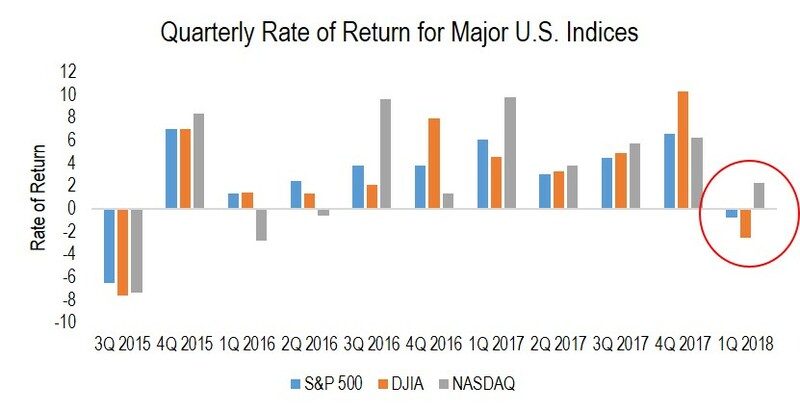 In addition to this increased level of volatility, both the S&P 500 Index and the Dow Jones Industrial Average recorded their first losses in ten quarters (-0.8% and -2.5%, respectively), while the technology driven NASDAQ rose by 2.3% (see chart below). Investors experienced the euphoria of the market hitting a number of highs in January only to be followed by sharp declines in February. In fact, the decline in early February resulted in the first correction (a decline of 10% or more) since the first quarter of 2016. 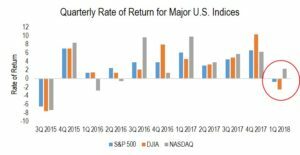 However, markets sharply recovered in early March only to be followed by more declines leaving us with modest losses for the S&P and Dow for the first quarter. This roller coaster of ups and downs was disconcerting to many investors. 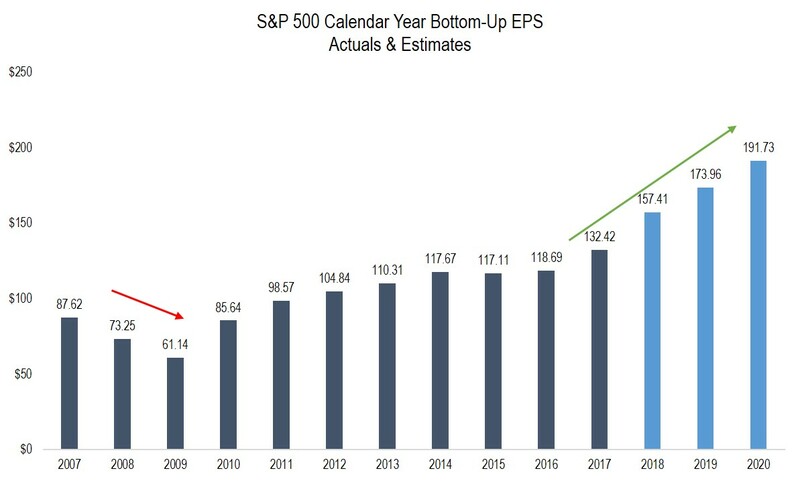 However, we were not discouraged given the underlying strong economic fundamentals that we continue to observe, and because we realize that downturns and corrections are a part of long-term investing. At the same time, the Federal Reserve, under the new stewardship of Chairman Powell, raised the federal Funds rate by an expected 25 basis points. In its official statement, the Federal Reserve pointed to a stronger economy and a continued strengthening in employment while inflation remains subdued at 2.4%. Accordingly, the Fed suggested that there would be an additional two, possibly three, more rate increases during 2018. 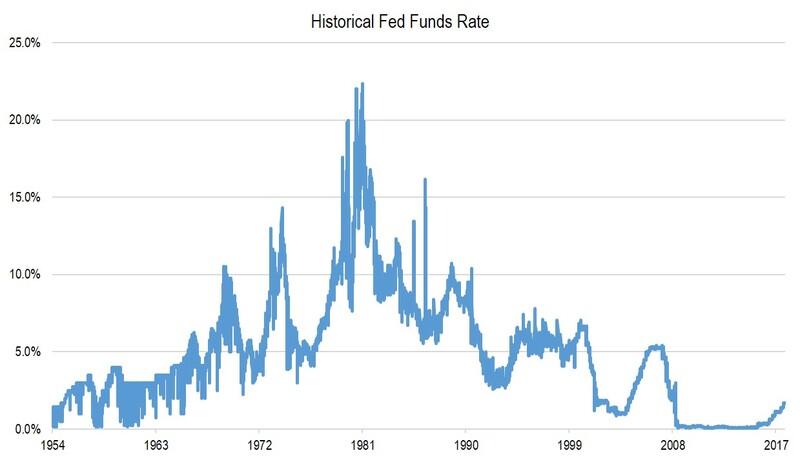 Given the still historically low level of interest rates (see chart below), these projected rate increases do not suggest to us major headwinds for the equity or real estate markets. However, those with long-maturity bond portfolios could see modest losses. It is for these reasons (low yields and a bias to higher rates) that we continue to underweight fixed income as an asset class. Given the above factors, we are pleased that all of our strategies1 for the quarter were either slightly positive or modestly negative. 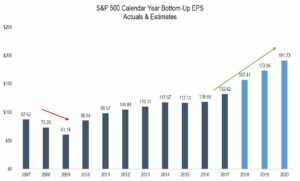 We view this as quite constructive given the significant absolute gains we enjoyed from all of our traditional and defensive strategies in 2017. In virtually all of our strategies we exceeded the respective benchmarks once again demonstrating the merit of active investing. We believe that given what we perceive to be positive drivers for the companies that we invest in, 2018 still should be somewhat of a positive year (although one should not expect returns to resemble those of last year). Profits for the companies that we invest in, and for many others, as seen in the chart to the right, should prosper in 2018 in part based on growing economies here and abroad. The Tax Cuts and Jobs Act of 2017 will reduce taxes for many of the companies we invest in, contributing to higher profits and increased cash flow. Repatriation of profits from overseas will also benefit many of the companies we invest in. Low interest rates and modest inflation, coupled with an increase in projected GDP growth, are constructive for equity markets. Consumer balance sheets remain in good shape supported by lower taxes, higher wages, and appreciating housing prices supported by an increase in housing formations. As stated in prior quarterly reports, synchronized global growth continues to support corporate earnings and business confidence around the world. A recession could occur (while we cannot time these, possibly in late 2019 or sometime in 2020). We are watching out for indicators including when the Treasury yield curve inverts, which is a harbinger of recession. A recession of the garden variety type (excess inventory) is not to be feared nearly as much as a “balance sheet” recession like 2008/9. Given the strength of most banks and consumers, we expect the “inventory” type of recession. However, equity averages typically decline no matter the type of recession. The extremism in Washington, D.C. resulting in an inability to compromise and effect reasonable change; the spending habits of Congress leading to a higher deficit (closing in on $22 trillion dollars); and the D.C. focus on political investigations, all create disruptions leading to greater volatility and investor confusion and concern. Geopolitical hot spots in Russia, the Middle East, and the Korean peninsula are top of mind. The immaturity of certain global leaders in dealing with these challenges is a significant concern. Election tampering, nuclear proliferation, and the multi-national war in Syria (Russia, Iran, the U.S., ISIS, Syria, and Turkey) continue to take Congress and the President’s time away from dealing with our growing deficit, the need for health care and immigration reform, and the ultimate need to restructure or rationalize both Social Security and Medicare, which are approaching financial crisis. These social safety nets must be preserved, but given the direction of demographics (more retirees requiring social benefits and less workers contributing to the system), some change is needed. From a purely economic standpoint, the potential of isolationism and trade war were major contributors to the uncertainty and volatility of the first quarter. We believe this will abate as time goes on. However, for the immediate future, it is a contributor to volatility and uncertainty along with some doubt over just how beneficial the recent tax legislation will be to our domestic economy. The Facebook data breach and misuse of personal information also riled the hot Information Technology sector. Disruptive technologies such as Facebook (a demonstration of American ingenuity and entrepreneurialism) will have growing pains and setbacks. However we do not believe this will derail Facebook, or any of our great tech companies including Alphabet and Amazon.com, which have transformed the way we communicate, gather information, and shop, as long as they do not break laws. 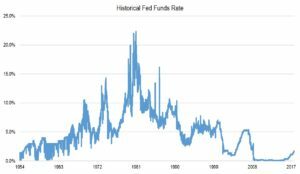 Very low interest rates for such an extended period of time could have produced less obvious excesses, which as they are unwound could create volatility and dislocation of financial markets. The above headwinds, which led to greater volatility and the first correction in major averages in more than two years, are a concern. In our opinion, this will not derail our equity-based strategies, which are concentrated and seek to invest in reasonably valued companies with solid financials, growing earnings, strong managements, and, in many cases, are beneficiaries of the recent tax law. Also, our bond portfolios remain typically short in duration so the creeping up of interest rates (thus far) should not be a major factor. Our current mezzanine real estate exposure continues to prosper with what appear to be good loans with equity kickers that have thus far resulted in solid returns. We anticipate recommending that suitable clients increase their allocation to this type of investment, when available. Directionally, we continue to be biased to our defensive strategies. Our rational for this is the probability that a recession is getting closer, interest rates remain low so that bond investments will yield little better than inflation despite rates moving modestly higher, and some of the factors causing this recent spike in volatility have the potential to be more disruptive than might seem apparent. In addition, we still have to deal with the divisive and confrontational nature of Washington including the approaching midterm elections. We continue to recommend an underweight to bonds (but have an allocation), an overweight our defensive strategies (all three), maintaining a modestly underweight allocation to traditional equities, and be selectively opportunistic in private investments, when and if they become available. Given a more challenging investing environment in the future, having a long-term view with a focus on quality remains paramount. In robust economies and markets, the tendency is for lower-quality equities or bonds to do better than they should. As economic and market circumstances become more challenging, these lesser-quality investments (typically weaker balance sheets) should not do as well as financially stronger companies in our opinion. 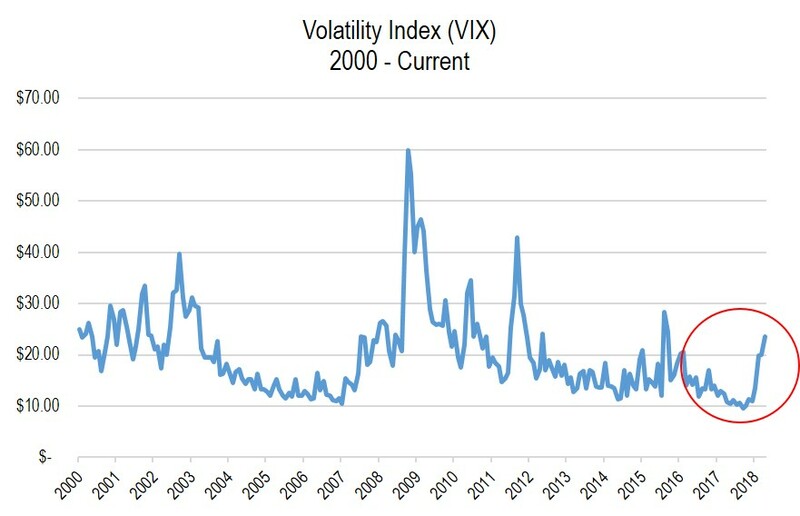 We actually use periods of volatility to enhance portfolio characteristics where possible in our strategies. We wish you a wonderful spring and hope to see you at our Thought Leadership Breakfast Seminar on May 23, 2018. The event will feature three prominent accountants who will share their perspective on the impact of the new tax law. We urge you not to hesitate to call upon us for any of your wealth management needs. It is a good time to focus on longer-term planning, including investments, estate planning, and insurance. The views expressed are the views of Robert D. Rosenthal through the period ending April 20, 2018, and are subject to change at any time based on market and other conditions. This is not an offer or solicitation for the purchase or sale of any security and should not be construed as such.